Although I was not born an Indian there is very little about my appearance, my tastes, my habits and my traditions to distinguish me from a daughter of the soil. Had I been born some years earlier than I was, I would have been an Indian in every sense of the term. My father was born before partition; the strange history of this subcontinent made him a citizen of three states, his daughter a national of two. In a village in what was then East Bengal, there once lived a farmer by the name of Haradhan Sarkar, one of whose sons, Komol, probably driven to fury by zamindari oppression, converted to Islam and became Kamal. I belong to this family. Haradhan Sarkar was my great-grandfather’s father. Haradhan’s other descendents obviously moved to India either during or after partition and became citizens of this country. My grandfather, a Muslim, did not. When I was a child, the notion of the once fashionable theory of pan-Islamic had been exploded by East Pakistani Muslims fighting their West Pakistani coreligionists. Our struggle was for Bengali nationalism and secularism. Even though I was born well after partition, the notion of undivided India held me in thrall. I wrote a number of poems and stories lamenting the loss of undivided Bengal, indeed undivided India even before I visited this country. I simply could not bring myself to accept the bit of barbed wire that kept families and friends apart even though they shared a common language and culture. What hurt most was that this wire had been secured by religion. By my early teens I had forsaken religion and turned towards secular humanism and feminism which sprang from within me and were in no way artificially imposed. My father, a man with a modern scientific outlook, encouraged me to introspect and as I grew older I broke away not just from religion but also from all the traditions and customs, indeed the very culture, which constantly oppressed, suppressed and denigrated women. When I first visited India, specifically West Bengal, in 1989, I did not for an instant think I was in a foreign land. From the moment I set foot on Indian soil, I knew I belonged here and that it was, in some fundamental way, inseparable from the land I called my own. The reason for this was not my Hindu forebear. The reason was not that one of India’s many cultures is my own or that I speak one of her many languages or that I look Indian. It is because the values and traditions of India are embedded deeply within me. These values and traditions are a manifestation of the history of the subcontinent. I am a victim of that history. Then again, I have been enriched and enlivened by it, if one can call it so. I am a victim of its poverty, colonial legacy, faiths, communalism, violence, bloodshed, partition, migrations, exodus, riots, wars and even theories of nationhood. The intolerance, fanaticism and bigotry of Islamic fundamentalists forced me to leave Bangladesh, herself a victim of the subcontinent’s history. I was forced to go into exile; the doors of my own country slammed shut on my face for good. Since that moment I sought refuge in India. When I was finally allowed entry, not for an instant did I think I was in an alien land. Why did I not think so; especially when every other country in Asia, Europe and America felt alien to me? Even after spending twelve years in Europe I could not think of it as my home. It took less than a year to think of India as my home. Is it because we, India and I, share a common history? Had East Bengal remained a province of undivided India would the state have tolerated an attack on basic human freedoms and values and the call for the death by hanging of a secular writer by the proponents of fundamentalist Islam and self-seeking politicians? How would a secular democracy have reacted to this threat against one of its own? Or is the burden of defending human and democratic values solely a European or American concern? The gates of India remained firmly shut when I needed her shelter the most. The Europeans welcomed me with open arms. Yet, in Europe I always considered myself a stranger, an outsider. After twelve long years in exile when I arrived in India it felt as though I had been resurrected from some lonely grave. I knew this land, I knew the people, I had grown up somewhere very similar, almost indistinguishable. I felt the need to do something for this land and its people. There was a burning desire within me to see that women become educated and independent, that they stand up for and demand their rights and freedom. I wanted my writing to invigorate and contribute in some way to the empowerment of these women who had always been oppressed and suppressed. In the meanwhile, a few Islamic fundamentalists in Hyderabad chose to launch a physical attack upon me. The decision to attack me was motivated by the desire to gain popularity among the local masses. 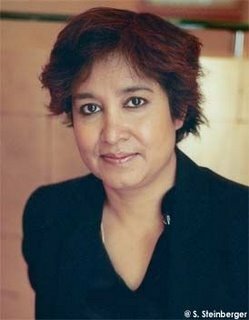 “A woman by the name of Taslima Nasrin has launched a vicious attack upon Islam and is all set to destroy the tenets of the faith. Therefore, Islam must be protected from this woman and the only way to do so is to kill her. Her death will bring many rewards: millions as fatwa bounty in this world, salvation and unparalleled delights in the next.” This is the manner in which Islamic fundamentalists in secular India are attempting to entice poor, uneducated, uninformed Muslims while simultaneously looking to solidify their vote bank within the community. After hearing of the incident in Hyderabad, fundamentalist leaders in West Bengal, where I live, became so excited that they wasted no time in issuing fatwas against me and calling for my head. Students from madrases who did not even know of my existence joined the fray. They knew of my blasphemy without having read a single one of my books. How did they know? Because their leaders had assured them that I had made it my mission to destroy Islam. Therefore, it was their individual and collective responsibility to protect and preserve their faith. Can one find a more perfect example of brainwashing? While their knowledge of my work may be infinitesimal, their knowledge of Islam is equally so and they have turned their faith into a commodity for their own base ends. Almost twenty per cent of India’s population is Muslim and, unfortunately, the most vocal representatives of this considerable community are fundamentalists. Educated, civilized, cultured and secular people from the Muslim community are not regarded as representative of the community . What can be a greater tragedy than this? A greater tragedy, arguably, is that I may have to endure in progressive India, indeed in West Bengal, what I had to endure in Bangladesh. I live practically under house arrest. No public place is allegedly safe for me any longer. Not even the homes of friends are above suspicion, nothing is above suspicion. Even stepping out for a walk is considered unsafe. It is felt that I should spend my days in a poorly lit room grappling with shadows. Those who threaten to kill me are allowed by the state to spew their venom. They have tacitly been given the rights to do whatever they desire from disturbing the peace with their demonstrations to terrorizing the common man in the name of their faith. Those that oppose them and their unholy brand of communalism, those who take a stance against injustice and untruth are silenced in invidious ways. I am warned both implicitly and explicitly that, for example, a fundamentalists’ demonstration is about to take place and it would be best for all concerned if I quietly left the city. Of course, do return by all means, but only when the situation has calmed down, I am advised. But will the situation ever calm down? For the last thirteen years I have been waiting for the situation to calm down. I was told the same thing when I left Bangladesh to go into exile. I refuse to leave because to leave would be to accept defeat and hand the fundamentalists the victory they have always desired. It would spell defeat for the freedom of expression, independence of thought, democracy and secularism. I simply refuse to allow them this victory. If they are eventually victorious, the loss will be as much mine as India’s. If India gives in to the fundamentalists’ demand to deport me, the list of demands will become an endless one. A deportation today, a ban tomorrow, an execution the day after. Where will it cease? They will pursue their agenda with boundless enthusiasm knowing that victory is certain. And, of course, the secular state and its secular custodians will bow down to every fundamentalist’s every whim and fancy. Giving in to their demands is not a solution and any attempt to appease them makes them even more dangerous and pernicious. Even in my worst nightmares I had not imagined that I would be persecuted in India as I was in Bangladesh. Persecuted by the majority in one and a minority in another, but persecuted just the same. The bigotry, the intolerance, the death threats, the terrors: all the same. I often wonder what good it would do them to kill me. The fundamentalists are very well aware that it may bring them some benefit but will do nothing for the cause of Islam. Islam will remain as it has always remained. Neither I nor any other individual has the ability to destabilize Islam. The face of fundamentalism, its language and its intentions are the same the world over: to grab civilization by the scruff of its neck and drag it back a few millennia kicking and screaming. My world is gradually shrinking. I, who once roamed the streets without a care in the world, am now shackled. Always outspoken, I am now silenced, unable to demonstrate, left without the means of protesting for what I hold dear. Film festivals, concerts and plays all continue around me but I cannot participate. I spend my existence surrounded by walls: a prisoner. But I refuse to acknowledge this as my destiny. I still believe that one day I will be able to resume the life I once enjoyed. I still believe that India, unlike Bangladesh, will triumph over fundamentalism. I still believe that I will find shelter and solace here. The love and affection of Indians is my true shelter and solace. I still believe I will be able to spend the rest of my life here free of cares and worries. I love this country. I treat this land as my own. If I were to be ejected from this country it would amount to the cold-blooded murder of my most cherished ideals, perhaps a fate far worse than I could meet at the hands of any fundamentalist. I have nowhere to go, no country or home to return to. India is my country, India is my home. How much more will I have to endure at the hands of fundamentalists and their vote-grabbing political allies for the cardinal sin of daring to articulate the truth? If the subcontinent turns its back on me I have nowhere to go, no means to survive. Even after all that has happened, I still believe, I still dream, that for a sincere, honest, secular writer, India is the safest refuge, the only refuge.